If you’re looking for secure storage with lots of capacity for your home or workplace, Apricorn’s Aegis Padlock DT is a good place to start the search. This 3.5-inch external hard drive is relatively affordable—for the secure storage market, that is. 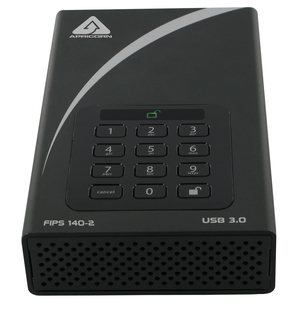 It’s FIPS 140-2 certified and can be administered via an on-board keypad. That makes it more versatile than solutions that rely on client software for encryption and access. 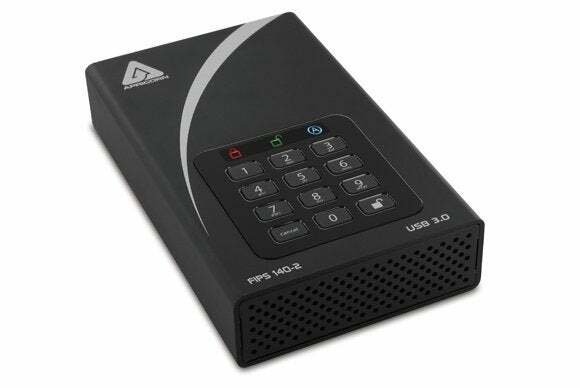 Apricorn’s drives are available with either 128- or 256-bit AES encryption. The 128-bit version is available in capacities from 1- to 3TB, while the 256-bit version can be purchased in quantities from 1- to 6TB. If you’re considering the $849 6TB model, make sure you really need that much storage on one device: You can double up on 4TB drives for less money (they’re $389 each). This review covers the 256-bit, 2TB model ($229). The keypad on top of the Aegis Padlock DT’s enclosure is used for entering PINs and administrating the drive. This means that in addition to PCs, it can be used by tablets, multimedia streamers, phones, and anything else that can read USB mass storage. Be aware, however, that some devices can’t handle drives this large, or understand the NTFS partition required for drives larger than 2TB. Three LEDs above the keypad report drive status: unlocked, locked, or in administrative mode. Administrative mode is used to define the master PIN (seven digits minimum) and up to four user PINs. User PINs allow access to the drive, but not the PIN definition or erase functions. Other features include a time-out that locks the drive after 5- to 20 minutes of inactivity. Protection from brute-force attacks is provided in three layers: After five incorrect PIN entries, you must power-cycle the drive. The drive will lock itself after 10 failed tries (with a secondary procedure that grants ten more tries). After 20 incorrect PIN entries, the drive will erase its encryption key, rendering its stored data uselessly scrambled. At that point, the drive must be completely reset before it can be used again. The drive requires more power than the USB bus can provide, so you'll need to plug it into an AC outlet. Our test Aegis Padlock DT with a 4GB Seagate drive on board proved an overall good performer, though it lagged slightly with large files. It wrote our 10GB mix of files and folders at 147MBps and read them at 164MBps. It then wrote a single large 10GB file at 104MBps and read it at 137MBps. The slowdown with the large file is most likely the encryption chip not being able to keep up with a long uninterrupted stream of data. Note that our tests copy to and from a super-fast RAM drive. Don’t expect quite the performance copying to and from other hard drives. 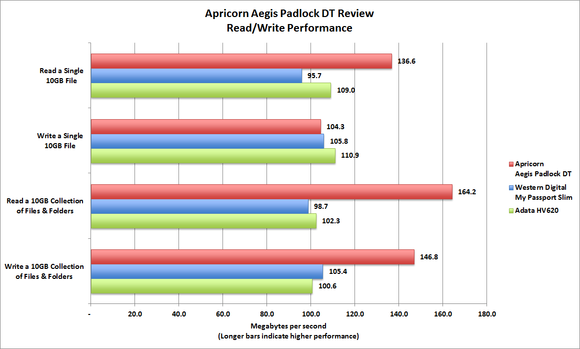 The Aegis Padlock DT performed well in our benchmarks, lagging only slightly while writing our single 10GB file. As you might guess, a toughened, secure 3.5-inch hard drive in a metal case won’t be particularly light—even if said case is fabricated from aluminum. The Aegis Padlock DT weighs 2.5 pounds, plus 6.4 ounces for the included AC adapter (the drive draws too much power to run off the USB bus). This is a storage product designed for sneaker nets, not international travel. But with FIPS 140-2 certification, a hardened case, plenty of capacity, and good performance, it’s hard to see where you could go wrong with the Aegis Padlock DT. As long as you don’t need to backpack it, it’s good stuff. If you need more secure storage than a thumb drive or portable SSD can provide, the Aegis Padlock DT is what you're looking for.